SharePoint Online, one of the Office 365 products, includes a special library that is specifically geared for PowerPoint slides. Think of a slide library acting as a slide headquarters. You have probably experienced the problem of looking for a company slide that you know you saw in the past. You might blast an e-mail out asking if anyone has the particular slide deck that you saw presented last year. You may get a reply, but how do you know that is the most recent version of the deck? After you track down the owner of the deck, you might get the right slides you need for your presentation. The SharePoint slide library provides a one-stop shop for slides. Open Internet Explorer and browse to the SharePoint Online slide library. The library contains all the slides anyone in your organization has uploaded to this library. To upload additional slides, you simply click the upload button at the top of the library. Select the slides you want in your presentation by clicking the selector next to each slide and then clicking the Copy Slide to Presentation button. Your slide presentation is built instantly in PowerPoint and ready for your presentation. In addition to building presentations from the slide library, you can manage and monitor your slides. You can select a particular slide in the library by clicking on its preview to open up the management page for that particular slide. The management page lets you edit a slide, manage its permissions, or even set up alerts for the slide. Cover any changes to any slide. Cover any changes to a single slide you select. Cover any changes to any slide you have created. Cover any changes to any slide that you were the last to modify. Because the slide library is just a specialized SharePoint library, it still has all the rich content-management features available to other libraries, such as check-in and check-out, versioning, security, and workflow. 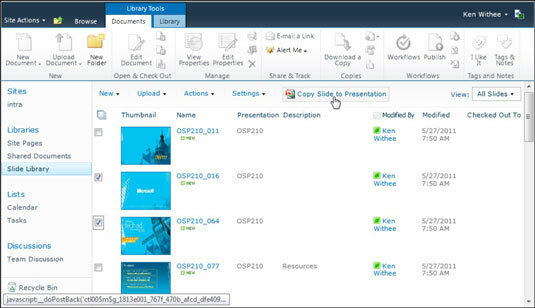 In addition to the specialized slide library, SharePoint also has a specialized library for managing rich media files, such as images, video, and audio files. 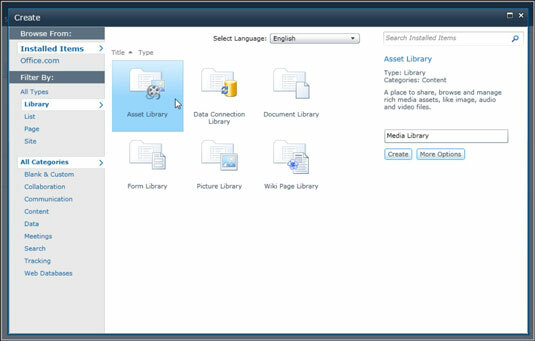 You can create one of these media libraries by selecting the Asset Library template on the Create screen. You can access the Create screen by clicking Site Actions from your SharePoint Site and then selecting Other Options.